This text has been submitted as an original contribution to cinetext on October 15, 2007. Angel Heart, which is based on William Hjortsberg's Faustian detective novel Falling Angel (1978), was written and directed by Alan Parker and released theatrically in 1987. Mickey Rourke puts up with a career-highlight performance as detective Harry Angel while Robert De Niro makes an everlasting impression as the noble, elusive and, ultimately, horrifying Louis Cyphre. On an interesting side-note, De Niro's performance as Cyphre is said to be an impersonation of famous movie director Martin Scorsese 1. 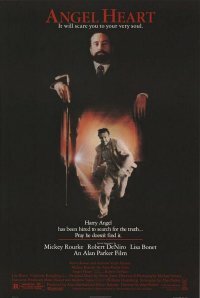 Without going into a detailed account of the differences between the film and novel, it should be noted that Angel Heart differs a bit from Hjortsberg's novel in the sense that it has a more oppressive and threatening atmosphere to it, yet they both share the same tragic and sinister undertones. Much like the novel, Parker’s film is firmly entrenched in what may be termed a postmodern (Gothic) noir atmosphere, which, in other words, is a shadowy world of crime, low-key lighting, mysticism, and slippery identities. In an overall perspective, one may think of postmodernism as something that embraces scepticism and challenges the idea of absolute authority in every possible way: “If any one common thread unites the diverse artistic and intellectual movements that constitute postmodernism, it is the questioning of any belief system that claims universality or transcendence.” 2 What often characterizes postmodern fiction on a general level is its ability to break away from traditional fiction and subvert the whole foundation of security and meaning in order to expose the meaninglessness and emptiness hidden underneath certain modes of thinking and experiencing things. In terms of literature, postmodern fiction is quite diverse: “Many of the works of postmodern literature…blend literary genres, cultural and stylistic levels, the serious and the playful, that they resist classification according to traditional literary rubrics.” 3 This view on postmodern literature could also be applied to Angel Heart in that the film incorporates and mixes various genres to great effect and succeeds in blending two different narratives. Professor Fred Botting ties an interesting comment to the narrative structure of the film: “Punctuated by flashbacks of mysterious shrouded figures, blood-filled bowels and blood-stained walls, the film suggest another story: one narrative, the detective story, is gradually supplanted by a Faustian tale of diabolical repossession.”4 This narrative structure is echoed in Hjortsberg's novel as well. Since irony is often utilized in postmodern fiction, it is quite interesting to note that Parker has kept some of the novel’s rather ironic elements and lines in the film. For instance, towards the end of the film, where everything finally dawns on Angel and he realizes that he has been tricked by the greatest trickster of them all, he hurries back to his hotel room, only to find himself the prime suspect in the killing of his daughter/lover, Epiphany Proudfoot. When detective Sterne says “You’re gonna burn for this, Angel”, Angel responds by saying “I know. In hell.” There is a morbid irony running through the film, exemplified by this particular scene where the detective is merely of the opinion that Angel will probably fry in the electric chair or be sentenced to life-imprisonment, not knowing that he will not only suffer earthly punishment, but also otherworldly torment. One may also find Angel’s atheist approach to life and his denial of anything religious or supernatural quite ironic when taking into consideration that his ‘other’ self, Johnny Favorite, was deeply steeped in occultism, mysticism and Satanism. In summing up this essay, Angel Heart clearly exhibits a number of traits and techniques belonging to postmodern art and fiction, for as it is stated in A Poetics of Postmodernism: “Postmodern art similarly asserts and then deliberately undermines such principles as value, order, meaning, control, and identity…”10, which is certainly also the case with Parker's narrative. It is possible to view the film as a piece of fiction where hierarchies are destabilized and where the narrative is a metafictional game in which the concept of how things are perceived is contested and broken down. It is a chaotic world of paranoia and split identities where what is thought to be fixed and stagnant is replaced by identity-chaos and an erasure of selves. It could then be argued that the possibility of solving the whole mystery in a conventional sense is ruined or rendered impossible when the film reaches its cryptic dénouement. As the title of this essay suggests, it is Angel’s last-minute-revelation that essentially reveals him as a hybrid villain/victim and pursuer/pursued. Abrams, M.H. A Glossary of Literary Terms. 7th ed. Boston: Heinle and Heinle, 1999. p. 168-169. Hutcheon, Linda. A Poetics of Postmodernism – History, Theory, Fiction. (1988). New York: Routledge, 1999. Willick, Martin S. “Defense”. In: Psychoanalysis: The Major Concepts. Ed. Moore and Fine. New Haven: Yale University Press, 1995. p. 485-493. © Copyright 2007 Jens Nepper & cinetext. All rights reserved.